This is the ONLY original Website of the Lüscher-Color-Diagnostic®. ALL other Websites are misleading plagiarism with wrong colors and wrong as to the contents. The original colors and forms of the Lüscher-Color-Test and the original Lüscher-Color-Diagnostic® are protected by international law. 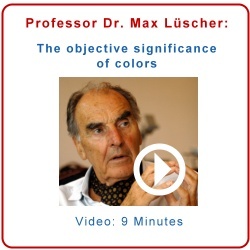 Every other color test is not from Prof. Max Lüscher and the original Lüscher-Colors and text are faked. The Lüscher-Color-Diagnostic® measures a person's psychophysical state, his or her ability to withstand stress, to perform, and to communicate. It uncovers the cause of psychological stress, which can lead to physical symptoms. Using 5015 precise definitions, the selections from among these pre-determined test colors measure the state of 23 personality traits, some of which lie outside the realm of the conscious. Because the color selections are guided in an unconscious manner, they reveal the person as he or she really is, and not as he or she perceives him- or herself, or as he or she would like to be perceived, which occurs when questions are asked directly or by questionnaires. The results of the Lüscher-Color-Diagnostic® (ca 5 pages) contains indications pertaining to personal assessment and special, professional recommendations as to how psychological stress and the resulting physical symptoms can be avoided. It also offers additional information for verbal and homeopathic therapy. Prof. Dr. Max Lüscher is the Head of the Institute of Psycho-medical Diagnostics in Lucerne (Switzerland). He studied clinical psychiatry, philosophy, and psychology in Basel. He has held a professorship in Amsterdam, teaching positions at the Universities of Paris and Rom, at Yale University in the USA, in South America, at universities in Western and Eastern Europe, and in Australia. The Lüscher Color Diagnostic has been in clinical use since 1947, and has been translated into 27 languages. His chief work is : "The Law of Harmony within Us" (ECON pocket book, 6th edition).